At Arizona Therapeutic Walk-In Tubs we are proud of the quality of the walk-in tub installations that we perform. You can purchase the best walk-in bathtub in the world and if it is not installed properly there can be many problems later. 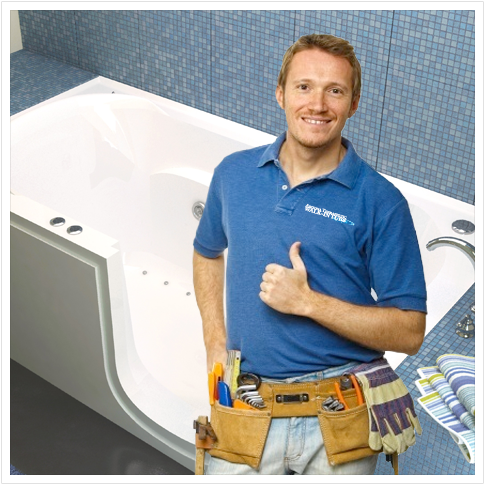 Our installation crews are factory trained and certified in walk-in tub installations. They have installed hundreds of walk in tubs in every situation that you could imagine. They have seen your bathroom many times before. Our installers aren’t going to stand around scratching their heads trying to figure out how they are going to put your tub in. They are very experienced with many years in the trades. You want a good job? Hire a professional. You want a quick install? Hire the best. We are the experts. Once we start your walk in tub installation we stay with your project until it is completed. We don’t jump around. Typical installation takes two days, sometimes more depending on the complexity and scope of the work. We often finish the installation in as little as one day. Our experienced installers are always courteous and respectful of your time, your home and belongings,and clean up daily and thoroughly after the installation is complete. Upon completion they will fill your tub and demonstrate the features and options for your tub and answer any questions. You will be provided with the use and care manual for your walk in tub and the warranty info. Arizona Registrar of Contractors #279580. CR61 Remodeling and Repair Contractor.